Fresh. Clean. Simple. Flexible. That's what the Blue Heaven Theme is all about. 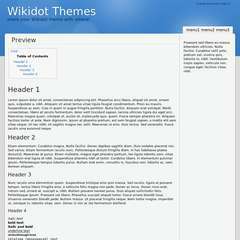 The theme is a fixed width of 960px, but can be easily adjusted to a fluid width. The sidebar can be positioned on the left, right or not displayed at all. The search bar also needs to be added to the sidebar (see below). For a live preview customised to show off the best of this theme, I recommend you head over here. IE6 spits the dummy at the sidebar. October 20, 2010: First release (v1.0). slight change to background colour of content-wrap. added support for drop-down menus in the topbar. fixed side bar search box problem in Chrome 8 on PC. It's a pretty good theme, but the lack of submenus should be approached! Apart from that, I particularly enjoy the cleanliness of the theme as well as the basic interface (large letters add to the simplicity). EDIT: Especially like the simple colours and the "no-avatar" username. Glad you like it. I just added support for drop-down menus in the topbar. I like themes that are easy to customize and your clear comments within the CSS are very helpful (and informative - I've always had a hard time with fluid themes and looking at your optional code helps alot). I'm planning to use this theme and playing around with a logo concept to see if it will mesh well. Anyway you do very good work and have an eye for detail and I hope to see more samples of your work here and on your css3 site. One thing I did observe, is that the mini search box does not display correctly in Chrome. Thanks for the kind words. The search box is displaying fine for me in Google Chrome - is there a specific site where it is not working for you? That's weird, here's what I'm seeing in Chrome 8 on Mac. What version of Chrome are you using? I only have a few addons for SEO. Maybe one of them is interfering somehow. I'll have to poke around I guess. I could see it on my PC - it appears to be a problem with -webkit-box-shadow: inset - I'll go fix it now. Ha you sound determined. I just checked on my desktop PC, same thing. Between that and your check I guess that confirms something in the CSS. By the way, that nivo slider on your homepage looks great! Yep that was it. Looks perfect, thanks alot for your help. I also use the nivo slider on many sites, often as part of the header, for example at Strathpeffer Golf Club and La Chapelle. It works very well with Wikidot sites.